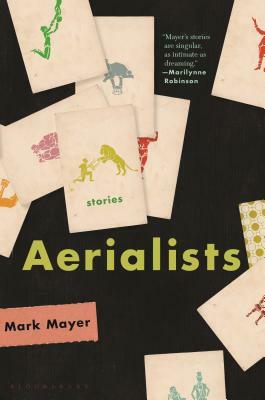 Welcome to the sublime circus of Mark Mayer's Michener-Copernicus-winning debut, Aerialists, a fiercely inventive collection of nine stories in which classic carnival characters become ordinary misfits seeking grandeur in a lonely world. Under the luminous tent of Mayer's prose, we see P.T. Barnum's caravan remade: A young misogynist finds a confidante in a cable-TV strongwoman. A realtor for the one percent invokes his inner murder clown. A skin-and-bones mathematician and his bearded wife plot revolution. A friendless peach farmer holds a funeral for a beloved elephant. And a model-train hobbyist prepares to throw his miniature world in the trash. The circus has always been a collection of American exaggerations-the bold, the beautiful, the freakish, the big. Aerialists finds these myths living in the everyday. Mayer's deftly drawn characters illuminate these small-scale spectaculars, and their attempted acts of daring and feats of strength are rendered with humor, generosity, and uncommon grace. Mark Mayer's stories have appeared in American Short Fiction, Kenyon Review, Guernica, Colorado Review, and Mid-American Review. Mayer has an MFA from the Iowa Writers' Workshop. He spent two years at Cornell College's Center for the Literary Arts as the Robert P. Dana Emerging Writer-in-Residence. He lives in Denver. "Connected through life in the circus, these stories delve into the lonely worlds of misfits and outcasts. While it would be easy to put the freak label on some of these characters, Mayer finds the nuances in their lives that give them humanity. The collection of short stories is dizzyingly fantastical on every single page." - Electric Literature - "The 20 Best Debuts of the First Half of 2019"
"Mayer may well live in the same world as you and me, but he’s able to see beyond it all somehow, and he finds extraordinary weirdness and beauty everywhere he looks. Aerialists is exquisite and wild." - Peter Orner, author of AM I ALONE HERE?